From our Beaded Drop Collection: We've been looking for a pale, very fresh shade of yellow for our beaded trim collections, and we finally found it! This "barely-there" shade of yellow is exquisite! 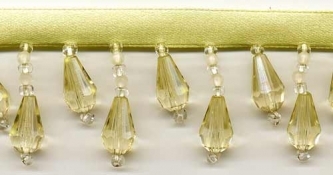 "Ice Cold Lemonade" Beaded Fringe trim is in sparkling translucent pale yellow faceted teardrop beads with seed beads in crystal clear and pale yellow. This is a high quality, very full beaded fringe with exceptional detail and craftsmanship. The longer beaded stands are 1" long, not including the pale yellow satin ribbon. This is an impressive and rich glowing color. Perfect for apparel or home decor.